You can download this chapter to print and read. 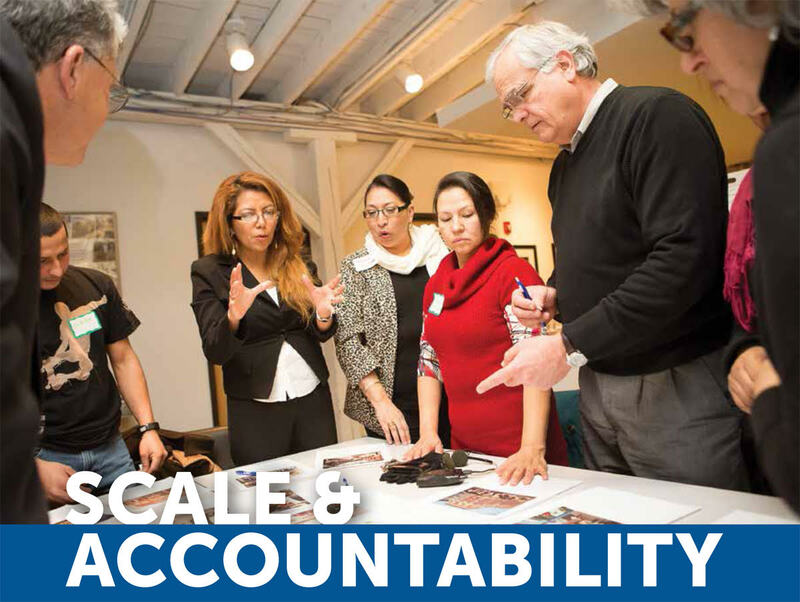 How can our field achieve scale while maintaining accountability to local community? Can Our Field Achieve Scale and Local Accountability? Community development corporations (CDCs) were born a half-century ago of community-based, grassroots advocacy. They have tackled affordable housing, but also issues from economic and small business development to healthcare – all to uplift communities. Indeed, the “c” for “community” signifies a commitment to people and neighborhoods. This commitment has helped CDCs stand apart from other initiatives. That direct connection to people and groups is essentially CDCs’ “brand” and the key to accomplishments to date. For all of their success, CDCs now face formidable challenges. Economic inequity is growing. Housing shortfalls in many areas are squeezing disadvantaged communities. CDCs not only worry that funding could shrink, but now face competition from new nonprofits as well as private-sector housing companies. And to top it all off, the very work of raising money and tackling housing and other problems is becoming more and more complex. The watchword NACEDA members hear in connection to the current state of CDCs is “scale.” In today’s environment, does it make sense for CDCs to “scale-up”, i.e. merge, combine efforts, or outsource back-office functions in order to streamline operations and make the most of finite resources? At the same time, does scale pose a threat to CDCs’ core, community-anchored mission? And perhaps most importantly, can CDCs achieve efficient scale while retaining a strong, community-centered focus? Q: When we talk about scale, just what’s at stake? Todd Swanstrom: There’s sometimes a romanticizing of smallness, but small is no good if you don’t have capacity to bring about results. City governments tend to get cynical about working with organizations that don’t have money and adequate staff. Joe Kriesberg: At the same time, there is no substitute for local engagement and building trust. If we don’t have local CDCs with deep roots, then nonprofit developers need to partner with local groups that do. In some communities, this can work well because there are strong local leaders with whom to partner. But in other places, the absence of a CDC may very well mean the absence of the local leadership needed to engage residents, conceptualize a vision, drive the process, and steward the outcome. Right now, the field is exploding with innovative new ideas on how to maximize scale and impact while maintaining local community engagement. Yes, it is hard. Yes, there will be failures. Yes, there will be compromises. But folks are trying. They are taking risks. They are thinking creatively. Q: But isn’t there a real risk of leaving communities and neighborhoods behind in the quest to scale up? Joe Kriesberg: We should promote both scaling up and community involvement. In fact, there may be systems or programs that can be designed that help us scale community engagement from centralized training programs, to regional or statewide campaigns, to mentoring and coaching of organizers. Our association doesn’t have a lot of direct leverage on CDCs, but we can facilitate conversations and use the bully pulpit to encourage and celebrate people who take risks. Ultimately, there is not one solution – there are solutions. We should support and celebrate a wide variety and create a space where it’s okay to fail. Ann Houston: What we sometimes see in mergers is that as soon as assets move from a specific CDC to a new organization, money talks louder than grassroots and the local community loses control. How do you retain local control, real local direction, and remain rooted in a community on the one hand and have enough scale and capacity in certain key issues, such as back office lines, which allow you to do increasingly complex work? That’s the perennial problem. Q: What factors help you to define scale? Marty Kooistra: In Seattle, we’re up against a hot market on steroids. Our board chair opened our 2016 retreat by saying that our best work and performance is not coming close to addressing the need before us. To put this in perspective, in King County today we need 154,000 units to house those who are homeless and cost- and severely-cost-burdened. Project the trends out to 2040 and the gap is 244,000 units. My current mission with the King County Affordable Housing Task Force is to remind everyone that we need to be willing to recognize that technical fixes aren’t going to have enough impact. We need to embrace the wicked problem as an adaptive challenge of which none of us has the answer. Bernie Mazyck: In South Carolina, meaningful scale for our association is filling gaps in services, resources, and capacity. Some organizations in the state do phenomenal things, but roughly 15% to 20% of our network of CDCs and CDFIs are high performing – that is developing a decent volume of housing units, new construction, home ownership or rentals, accomplishing consistent workforce development, micro-enterprise development, or community lending. We’re in a conservative state that doesn’t have a history of community development or deep infrastructures of programs and allies. We don’t get much policy support at the local and state level. We even have to use to different language to make our case with policy makers. We can’t say we’re helping poor people. Instead, we have to talk about workforce development, job creation, and return on investment. And we want to secure funds before they wither on the vine. Karl Guenther: A question that doesn’t get asked a lot is how to define an environment that enables scale. St. Louis is a slow-growth city in an older industrial region in the Midwest, an urban area that has both issues of affordability and a need to rebuild its housing market. There’s not a lot of individual wealth and the region has weak ties to national philanthropies, and almost no connections to large foundations. Q: It sounds as if you have no choice but to take on systemic scale. Karl Guenther: Community Builders Network spearheaded a task force to draw up a roadmap for a community investment system. We invited banks and funders together and got conversations started locally about what an effort would look like over the next 10 to 20 years – this all before the time came for fundraising. The direct result is INVESTL, that gathered $700,000 in funding from 15 banks and four foundations. Marty Kooistra: In Seattle, we have to contend with nonprofit members and public funders who believe that we can get the type of exponential output that will make a difference by simply putting more resources in the same function box. To reach the level of need requires an unprecedented scale that would dictate totally different approaches rather than incremental tweaks to the way we work. So, we’ve looked to stretch by building systemic scale too, while staying focused on the bigger picture. We wrestled with to work that out in connection with the Seattle Housing Affordability and Livability Agenda or HALA. We knew we needed to set a new affordable housing production goal that was “of-scale” – 50,000 new units in 10 years, 20,000 of which would be income and rent restricted. That requires a tripling of our current production which, by the way, is already double of that of San Francisco. Q: Back to community accountability: How can community development associations weigh in on the scale-versus-community-commitment debate and come up with both-and solutions? Joe Kriesberg: We can use policy to hold groups accountable to high standards without telling them what to do. In Massachusetts, we created the Community Investment Tax Credit program to drive private resources to high-performing groups that meaningfully engage the community AND produce impact. Here’s how it works. CDCs submit 15- to 18-page “community investment plans” that detail how they engaged the community to develop a strategy for their organization and then lay out the strategy and their capacity to execute and evaluate. Twenty percent of the score is based on the quality of the community engagement process. Once CDCs are selected, they can provide donors with a 50% donation tax credit. This helps them raise more private, flexible money to implement their community-driven agenda. The program has increased from $4.7 million in its first year to nearly $11 million in funding for CDCs statewide. The legislature just approved legislation to double the program thanks to a policy campaign led by our association. This is one way we are seeking to help our members scale their impact, scale their resources, scale their partnerships, scale their supporters AND scale their community engagement efforts. We designed the program this way so that resources would flow to CDCs that can effectively engage the community, articulate their value to the public sector, and secure donations from private funders. In our experience, CDCs that do those three things well are the most effective CDCs. Bernie Mazyck: One of our approaches is to backstop local organizations and create opportunities for local connections to larger programs. The key is to have an organization on the ground that can do outreach, engaging local residents, setting up workshops, and providing follow up. An example is one of our member organizations which works specifically with land owners who are land rich and cash poor. Many are African American, own a plot of maybe 30 acres of undeveloped, unproductive land. As an intermediary, we’ve forged a link between our member and a USDA program to reimburse landowners for the costs of reforesting to harvest timber, or for growing produce or vegetables. We’re only in the first year of the contract – a $50,000 partnership – which can grow and renew if we continue. Q: How viable are CDC mergers as an option? Todd Swanstrom: Mergers can put organizations on much better fiscal footing and a more diverse funding base whereby they are no longer dependent on block grants. In the case of the Tower Grove neighborhood, a CDC merger created an organization with much more political autonomy. Previously, the boundaries of CDCs in St. Louis corresponded with wards, and there was a time when alderpersons could influence what projects were funded. The interesting thing is this union of three CDCs now stretches across several wards. It has afforded the new organization autonomy and the ability to listen to the community – it can’t be undercut or taken down by various stakeholders. We know the politicization of community development is everywhere, but it’s the voice of the community that should be heard first, and the job of elected officials to help that happen. Ann Houston: We set up Opportunity Communities (OppCo), as an alternative method of building scale and preserving community control while mitigating the reluctance two or more CDCs might have to partnering. Nancy Turner: Two organizations, The Neighborhood Developers (TND) and Nuestra formed a new, third 501(c)(3) nonprofit late last year which launched in April. Each CDC remains independent: OppCo merges staff in several key areas which it employs, then leases back to TND and Nuestra. For real estate development and resident services, most senior staff is now centralized and we have dedicated staff for each CDC dedicated to one office or another. The initial vision was to ultimately sign on 10 CDCs, starting with two in 2019. We won’t need to double the number of people working here since we’re already enjoying economies of scale. We have one CFO since Nuestra was contracting that position out. We’ve blended the finance team – one person to handle receivables and payables and one payroll person. Before, TND had a staffing gap for a head of resident and tenant services when an employee left. Nuestra’s tenant services head has filled that role. Ann Houston: We’ve sought to centralize operations like financial management, HR, professional development, learning and evaluation, data management, resource development systems, grant management systems – back office administrative tasks CDCs can share while remaining focused on their neighborhood and core constituencies. One big benefit is in learning and evaluation – work that supports CDC development. TND has spent the last eight years working on a Salesforce system for all of our client management. We track every real estate project – all construction types, financing, unit counts, and profiles of each real estate development. Through tenant services, the program has goals to identify work for property management. We can flag tenants who are behind in payments, for instance, we have 175 households across the CDCs flagged right now. That makes it possible to figure out what kind of outreach and services to link tenants up to and help in real -time. It’s a plus for our grant work. We used it to track all of our annual workplans and deliverables. Funders are increasingly asking for this. Q: Can efficiency from scale ever substitute for building strong bonds with neighborhoods? Joe Kriesberg: No. Listen, all affordable housing developers can face opposition in local communities from those who have legitimate concerns about scale, traffic, parking, and other impacts to those whose opposition is based on racism or classism. CDCs – at least those with deep roots and strong community engagement capacity – can mitigate that by organizing their members, allies, and supporters. Credibility with local stakeholders can help them weather the storm and navigate political challenges. When organizations try to develop affordable housing without those local connections, they can find themselves in trouble quickly – something we have seen in Massachusetts on more than a few occasions. Bernie Mazyck: We learned that we need a strong partner which is well-rooted in a target community in order to make scale work. A few years ago, we launched a Neighborhood Stabilization Program project in Greenwood, South Carolina as an opportunity to bring in a needed service, two-and-a-half hours from Charleston where we’re based. We anticipated $1 million to purchase, rehab and resell 15 to 20 homes. We couldn’t find a partner directly in the community to provide operational support, so we worked with groups in neighboring towns. The distance made things complicated, especially since we were the sponsors. Our own staff had to kick in time driving back and for to Greenwood. We estimated the project would last two years. It took four years from the purchase of the units to the time we sold them. Q: So just how new is the notion of scaling up? Joe Kriesberg: If you think about it, scale is behind the creation of CDC associations in the first place – it helped small CDCs combine their power in order to influence the larger system. We are examples of how CDCs can collaborate so they don’t have to go it alone. We do it in offering insurance, providing training programs for CDC staff, helping to set policy, and in a myriad other ways. Q: Looking forward, what should NACEDA members take away as new ideas? Ann Houston: Change is always a struggle. For OppCo, there was concern on the part of board and staff members that each group would lose unique identities or one organization overpower the other. It took real commitment. We made sure there was equal representation from both CDCs, especially on the senior leadership team. The other source of resistance, fear of change, is always daunting because this is a new model. We’ve stressed at every step that this is very much a both-and framework. We’ve sought to allow each of the CDCs to serve their base communities and that’s helped to deepen our sense of mission. Marty Kooistra: The goal is to create the greatest programmatic output achievable with the least organizational weight. Most efforts to scale, however, are plagued by adding infrastructure and assets months late instead of strategically in advance to pave the way. It’s really about allowing people to embrace a different vision of outcomes. Too often, a scarcity mentality drives internal thinking. Community development associations have to figure out how to get out of this perspective. Joe Kriesberg: In the end, community engagement – recruiting resident leaders, developing more leaders, organizing residents and business owners – is the only way our field achieves scale because ultimately this is a political question. The only way we secure the policies, programs, and dollars we need to truly scale up is to build political power – and that means building community leadership that can mobilize people at the grassroots level to influence the policy making process. James A. Anderson is a tenured English professor at the Lehman College campus of the City University of New York and a journalist with over 25 years' experience covering economics as well as finance and community development. His work has appeared in Shelterforce, Barron's, The New York Times and Black Enterprise Magazine among other publications. We should be cautious about ambitions of scaling up that overly focus on CDCs growing bigger operations as affordable housing developers without deepening or broadening the commensurate scale of community engagement and community-building. Sure, bigger projects and more units can get built, but it does raise a question about the “community” part of the CDC model. Some CDCs continue to hold strong to that model and focus on a core “base” neighborhood or constituency while branching out to do scattered housing development projects when opportunities arise. But they always join with a local community based partner to connect the project to local organizing and community-building. CDC associations, like ours in San Francisco, are also the means by which CDCs can scale, to facilitate partnerships when needed across a wider geography while maintaining the core local focus of each individual CDC. That serves as an effective coalition-building model, both within the association of CDCs, with basebuilding community organizations outside the CDC “sector,” and with other organized sectors that have critical touchpoints to housing such as labor, faith organizations, health services, transportation, and environmental organizations. From this coalition-building at various scales, political power can be strong and results can flow to the benefit of greater community impacts. However, that coalition-building model is challenged by the model of scaling-up that primarily focuses on growing big individual organizations. Funding and political power can flow to that model as well, and in many respects, it is easier to grow one organization than to undertake the continuous enterprise of collective work through associations and coalitions. But, if in the end we believe that the political power which fuels our CDCs movement is a collective community-based power more than just the raw concentrated power of a few major players, then we should look to coalition-building as the method to scale-up organizational impact. Peter Cohen is co-director of the Council of Community Housing Organizations in San Francisco, California. I would like to offer a perspective on how a subset of community development, affordable housing, can reflect the necessary balance of scale and accountability. My organization, the Massachusetts Association of CDCs, researched the scale of affordable housing projects awarded funding in the State Department of Housing and Community Development’s annual rental round for tax credit and other projects. Since 2011, they awarded almost $440 million in state bond funds for the development of just under 12,000 rental units. Only 2% of these units were in projects with fewer than 20 units. And, only 6% of the total soft debt subsidy (not including tax credit equity) went to these smaller projects. Why does this matter? On one level, scale is absolute. A 200-unit project provides 10 times as many homes as a 20-unit project. But on another level, scale is relative and that is in the context of Impact. Recently, our board members had the opportunity to tour several blocks in the City of Worcester, where Main South CDC has transformed a once-blighted neighborhood. Over a period of several years, the CDC acquired sites where they built or rehabilitated a series of small rental and ownership projects. In addition to the approximately 140 new affordable homes, Main South CDC partnered with Clark University and other local institutions to develop playing fields, make improvements to a local park, and use a U.S. Department of Justice grant to work with the City on crime reduction. In a park where young people playing basketball were once imperiled by frequent drive-by shootings, we saw families with strollers, people of all ages relaxing, and yes, young people playing basketball without fear. Main South CDC Director Steve Teasdale pointed out that the evening before, over 200 people attended a concert in the park. This revitalization would not have been possible without state funding for small-scale, high-impact housing development, which anchored the neighborhood revitalization efforts. To that end, our association’s advocacy for a dedicated pool of state funds for small-scale rental projects (fewer than 20 units) paid off. We succeeded in obtaining the State’s acknowledgement that small-scale housing can have a large impact. Public funding programs support housing development initiatives of community-based organizations, including smaller organizations, regardless of the number of units in a project, so long as the “scale of impact” is significant. Don Bianchi is senior policy advocate for the Massachusetts Association of Community Development Corporations. Community development, as a field, has demonstrated its ability to achieve both scale and accountability. One of the distinguishing features of community development is the ability to engage diverse stakeholders and achieve significant community development results in affordable housing, commercial revitalization, business development, community facilities, workforce development, and other vital community initiatives. In our book, Navigating Community Development: Harnessing Comparative Advantages to Create Strategic Partnerships, Dee Walsh and I draw from 50 years of community development history to point to the need for CDCs and other community development organizations to master a series of core competencies and find partners who have competencies that you lack and are needed to succeed in community development. Finding partners with complementary skills is one of the best ways to scale community development through engaging diverse stakeholders and sectors. Accountability strategies and capacities are just as important as technical development competencies. We identified community engagement and public policy; communications; organizational development and leadership; and collaborations and partnerships as core community development competencies. One of our case studies on Northwest CDC in Milwaukee, showed how a small CDC leveraged their deep community knowledge to partner with large industrial employers and connect people who need jobs to quality jobs. REACH CDC in Portland, Oregon, wanted to expand into a new region and state and did this by partnering with a small CDC who had strong roots in the community and knew the political landscape. East Bay Asian Local Development Corporation was able to launch an ambitious healthy neighborhoods initiative through engaging a dozen community partners. Older adult residents realized benefits such as funds to remove blight, increasing the walking time across busy intersections, and having a Federal Qualified Health Center provide hypertension screenings. Community development has always strived to be comprehensive in responding to the political, social, and economic challenges and opportunities of diverse communities. We need different types of organizations to build political and economic power and to marshal resources. Networks and associations have been integral to the growth of community development in helping develop and build a movement and industry while representing the aspirations of individuals and organizations. Fahe is a good example of a network: 50-plus community organizations in Central Appalachia serving low-income and other vulnerable populations that now develop over 8,000 affordable homes a year. Fahe was able to leverage the specialized expertise of their members to achieve scale together. Collaborations and partnerships are operational strategies for advancing both accountability and scale. There are 14 different types of partnerships from an MOU at one end to a merger at the other end which is often among equal organizations, while acquisitions tend to be strong organizations taking over week organizations. Collaborations are becoming more important for integrative strategies that incorporate health, environment, arts, financial capability, and other initiatives into the community development tool box. These collaborations enrichen communities and bring diverse stakeholders together to advance the shared vision of community development. Community development is both an art and science based on hope and possibilities. Refer to the Talking Values discussion guide for ideas. How would you define "scale"? How would you define "community accountability"? How would we know if we achieved either?How do you think a focus on increasing scale might place us at odds with the desires of the communities we serve? Can efficiency from scale ever substitute for building strong bonds with neighborhoods?